The forces of evil, both natural and supernatural, are poised to prey on the folk of the hamlets and hollows: witches, demons, and criminals of more than one century. But first they'll have to overcome some very unusual residents of the hills and valleys. 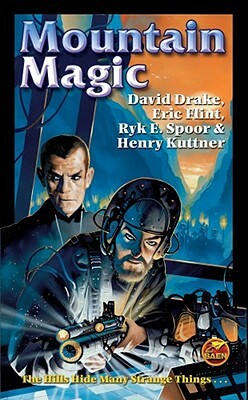 One is David Drake's unforgettable creation, Old Nathan the Wizard. He doesn't claim much for his magical powers, but they're real enough for what they are-and besides, he hasn't forgotten how to use his long flintlock rifle. Enter the gritty, realistic world of Old Nathan, a backwoodsman who talks to animals and says he'll face the Devil himself-and who in the end will have to face the Devil in very fact. A century later, very different interlopers, from criminals to snooping college professors, are poking around the hills, up to no good. But a very unusual family, the Hogbens, are likely to cause more trouble than unwelcome visitors can handle, as Henry Kuttner relates. They're a family of mutants, with very unusual powers, and city folk who cause trouble are likely to suddenly find unbelievable-and unpleasant-things happening to them. But not all of the trouble is caused by humans, as the Slade family find out when Eric Flint and Ryk E. Spoor relate how a Kentucky family finds itself caught in the middle of a struggle between battling groups of the creatures who live deep underground and are the basis from the old legends of gnomes. The Slades have to make sure that the right gnomes win-or an earthquake will wipe out everyone in at least four states. Magic, mutants, and mountain folk add up to an unusual volume, with adventure ranging from the grim and eerie to the wildly comic.